We’ve recently been experimenting with variations on the gnudi from the Spotted Pig restaurant in New York City. The version there is made with sheep’s milk ricotta, which we have no easy access to. It's light, pillowy, unctuous, and somehow seemingly weightless, despite being loaded with fat and sauced with about a quarter-cup of sagey brown butter. This stuff is by no means healthy, but if you refrain from feeding your kids Big Macs and the like, once in a while a dish like this is ideal. The kids adore it. But then again, much like all children, they are cheese freaks. In a large bowl, mix together the ricotta, egg, flour, salt, pepper, and nutmeg until just combined. Using a tablespoon, scoop up a good measure of the mixture and roll into a sphere, much like making a little ricotta snowball roughly 1½ inches in diameter. Place on a floured surface. Repeat until you have a whole mess of little gnudi, made in as uniform a size and shape as possible. At this point you should refrigerate the gnudi for at least a half hour before proceeding. You can also freeze them for future use. Bring a pot of salted water to a gentle boil, add the gnudi, and cook until they float to the surface. While the gnudi are gently boiling, melt the butter in a saucepan until it has foamed, the foam has subsided, and the butter starts to turn a honeyed sort of brown. Add the sage leaves and cook, stirring a bit, until super-fragrant and a bit crisp. 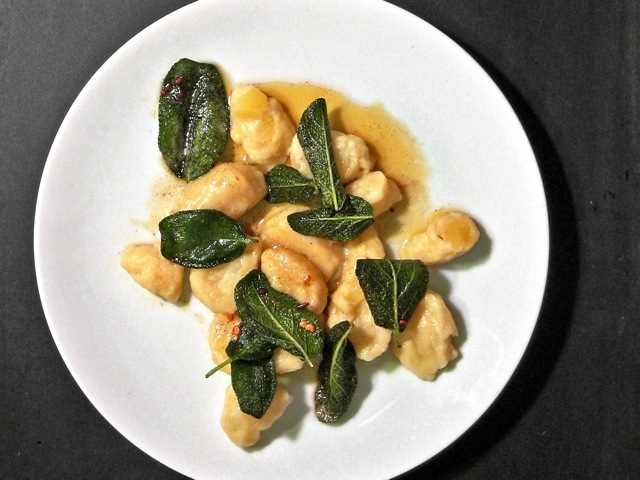 Once the gnudi are cooked, divide them among bowls and then top with the browned sage butter, with the crispy sage as a garnish. Top with a serious grating of Parmesan. Serve immediately to deafening applause from children of all ages. Culinate editor's notes: If your dough is too wet to handle, mix in more flour; otherwise, your dumplings will be soggy and wet, even if they float when cooked. If you have leftover roasted sweet potatoes (about 1 to 1 1/2 cups), mash them up and add them to the gnudi dough. Some sliced or chopped garlic is nice added to the butter sauce, too. Finally, if you're feeding adults instead of children, this recipe serves four adults as an appetizer or two as a main course.